Brushing your small child’s teeth may feel more like a wrestling match than part of a hygiene routine. At the same time, no parents want their children to suffer from preventable dental problems. Additionally, many parents are unclear about when to begin paying attention to children’s oral health. Here is a simple guide to protecting your child’s oral health to help take the guesswork out of this important part of parenting. You should begin brushing your child’s teeth as soon as they appear. Alternatively, if your child struggles with the toothbrush, you can wipe their baby teeth with a wet washcloth. If you add this practice to your getting ready and bedtime routines very early, your child will be less likely to fight about it. For toddlers, use a very small amount of toothpaste (the size of a grain of rice). After age three, you may increase that amount to the size of a pea. Children are not ready to brush their own teeth unsupervised until much older, around age 7 or 8. So continue to oversee the process until you are sure your child will brush every surface of their teeth. 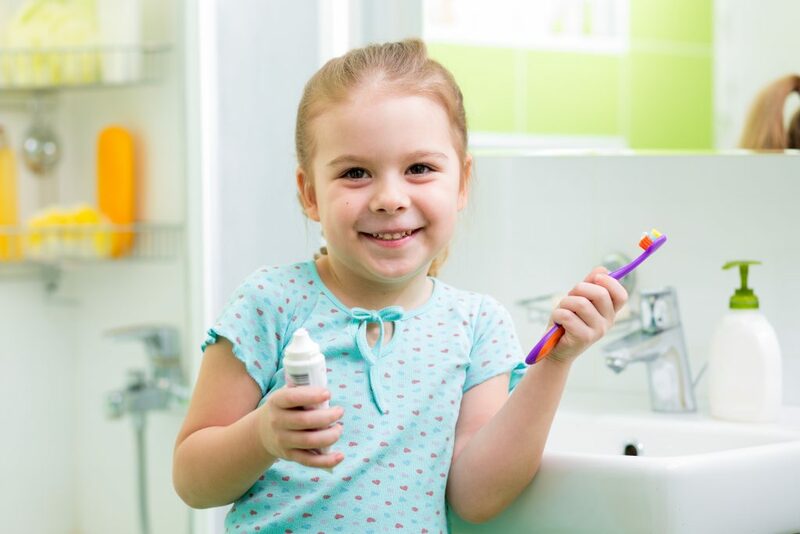 When kids struggle against tooth brushing, it becomes a disheartening and worrisome task. However, it is worth the effort to get your child’s teeth clean. Even baby teeth serve very important roles in your child’s development, including helping them develop proper speech and holding space for their adult teeth. If your child struggles, try to make tooth brushing a happy time. Sing songs, play games, and tell stories. Not sure what song to sing? Check out “Brush Your Teeth” by artist Raffi. It’s a catchy tune that you can find on most online music services or on the Raffi CDs available at the Gwinnett County library! It can also help your child participate in tooth brushing if he has a role to play. This may mean that he is in charge of helping you put toothpaste on the toothbrush, rinsing the brush, and putting it away. Additionally, many parents have found it helpful to have a second toothbrush on hand for their toddler to hold. An electric toothbrush may be more efficient if you’re only able to get in a bit of brushing at a time, and some children prefer it to brushing manually. Children should visit the dentist no later than their first birthday. This first visit will serve as an introduction, allowing your child to become accustomed to the dentist’s office and the dentist to do a quick check of your child’s mouth and gums. However, if your child is older and has yet to see a dentist, don’t fret. Just make an appointment as soon as possible. Dentists can tell a lot about a child’s oral health just by a simple examination, and they will be able to equip you with good tips and information to help you maintain good oral health at home. Don’t underestimate the link between what your child eats and drinks and their oral health. Sugary and acidic drinks like fruit juice or soda wear down the enamel of your child’s teeth and can cause rapid decay. Additionally, sugary foods like cookies or candy invite the growth of bacteria that can do serious damage as well. While there’s nothing wrong with occasional treats, try not to offer them daily, and never allow your child to go straight to bed after eating without brushing first. Oral health is an important part of overall health. Studies have linked poor dental hygiene with heart disease, diabetes, and more. By protecting your child’s teeth, you are giving them the gift of health and confidence. If you are looking for childcare in a place that encourages children in all aspects of self-care, consider Legacy Academy Snellville. We help every child become the best version of themselves.